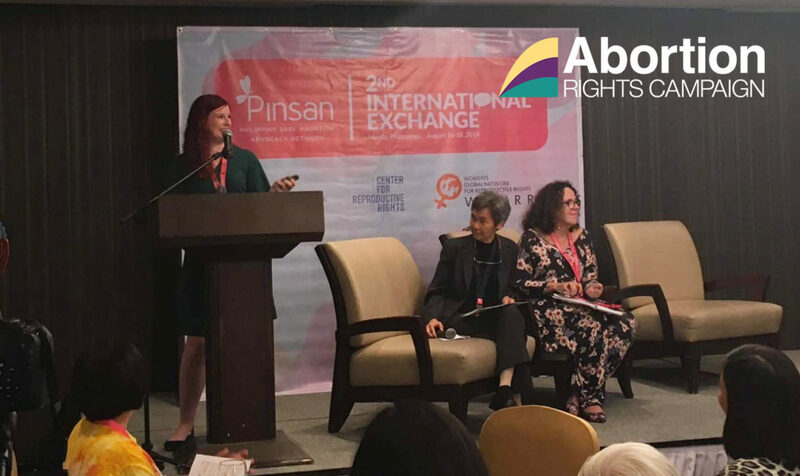 Two months after the referendum campaign the Abortion Rights Campaign (ARC) was invited to a conference in the Philippines. It was hosted by the Philippine Safe Abortion Advocacy Network. In many ways, the Philippines is very similar to us in Ireland. They have almost identical abortion laws. The consequences of these laws, however, are very different. In the Philippines, three women a day die from backstreet abortions. In Ireland, meanwhile, three people a day order abortion pills online. Another at least nine people travel to the UK. Without access to safe abortions overseas or safe but illegal abortions from the internet we too would have had our own deaths – much more of them. It has been the case in Ireland of those who were too sick, too poor, too young, too foreign, or too vulnerable to be able to access these lifelines that showed just how much of a struggle we share with the Philippines, and many other countries the world over. In my role as Together for Yes spokesperson I was interviewed by international press almost daily. But my focus was firmly in Ireland, surrounded by the people who I had battled alongside for my previous four and a half years of campaigning for repeal. It wasn’t until I first walked into that conference room in the Philippines to address a room of international advocates, that I began to grasp the impact our work and the campaign had had across the world. As I began to speak, women cried -, women who had dedicated decades of their lives to the struggle for abortion rights. Ireland’s result had given hope that change was possible, a hope that hadn’t been seen for almost a generation. I know myself what it’s like to forget what hope feels like. Endless setbacks, stalling tactics, reversals on promises made, stalling tactics, along with the relentless expenditure, exposure and dedication of those who so vehemently opposed change. On the second day in the Philippines we visited a small community in the Barangay Batasan Hills. Following the screening of a documentary, groups of local women held conversations about pregnancy, childbirth and even abortion in an open community forum for the first time. It was incredibly powerful and brought me right back to Ireland. To the referendum, but also to the years where ARC regional groups began to emerge nationwide, often sparked by one person willing to put themselves out there, be the instigator and do the heavy but vital work of organising on a local level. Meetings just like that are what changed Ireland, creating safe spaces for people to come together, to share, to plan and to instigate change. For the most part, the people who changed Ireland were ordinary women, talking and listening to other ordinary women. In those workshops I spoke about ARC’s roots and ethos, how from day one we have fought for free safe and legal abortion, and nothing less. In any movement it is important for there to be a strong uncompromising voice demanding change that leaves no-one behind. Many in Ireland had thought we weren’t being realistic enough, that even our name should be less direct. Grassroots, intersectional, non-hierarchical, community- based campaigning has changed the face of our country and will continue to. For the rest of this year we will be pressuring government to publish legislation which enables meaningful access to safe abortion for people who need it, and to enact this new legislation as quickly as possible. Unless the poorest or most marginalized people can access abortion then ARC does not feel that our work is done. We owe it to so many to get this right. And we know the rest of the world will be watching.